It`s time to get romantic folks! Send 6 long stem red roses to your darling and celebrate your love (or crush!) this Valentine`s Day! Nestled inside our exclusive presentation rose box are the most exquisite 50cm long premium Colombian red roses ready to sweep your sweetheart off their feet. Beautifully packaged, this romantic gift is guaranteed to make your other half feel super special on the most romantic day of the year. Please Note: Our team are now taking orders for rose delivery on Valentine`s Day this Thursday 14th February. Due to volume and logistics on this day we are unable to guarantee specific delivery times. All roses delivered for Valentine`s Day will be made anytime between 7 to 5.00pm for work addresses and between 7 - 7pm for home addresses. No re-directs will be possible if the recipient has left the delivery address for the day, however we will try, where at all possible, to accommodate your needs if this situation does arise. No changes to orders can be made after 18:00 AEST Thursday 7th February for Thursday 14th deliveries. We thank you in advance for your understanding! Order your super romantic 6 long stem red roses now for Valentines Day via this online florist store, email our fabulous love cupid floral consultants at sales@flowersforeveryone.com.au or give us a call on 1800 66 66 46. 2019-02-21 Service rating : Delivery wasn’t made and I requested refund. Still haven’t gotten the refund yet!! 2019-02-21 Service rating : I was called after the deliery time - and told that it wasn’t going to be delievered. Then I asked for a refund to be processed - the man I spoke to said they were sorry and would do that straight away. And got called back 4 days later saying I hadn’t indicated what I would like to do. A lack of integrity and credibility on two sperate instances. Product : They never got delievered. 2019-02-20 Service rating : As always quick service, and the flowers were delivered on time, and in excellent condition. The colors matched the ones on the web page. I`m very happy, and will continue to use this service. Product : Easy to deal with, and speedy process. 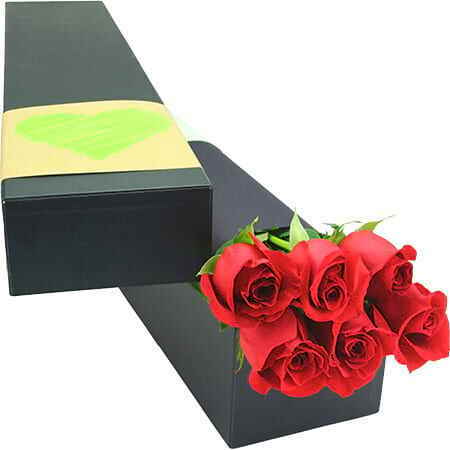 2019-02-15 Service rating : I ordered roses to be delivered to my gf for valentines day.